Teeth are built to last a lifetime. There are certainly factors that can shorten this span including genetics, health problems, lifestyle choices, injuries, accidents, and more. But with the right protection and care, your teeth can serve you for the rest of your life. In order for your teeth to better serve you, you must protect and care for them. The more vigilant you can be with the maintenance of your oral health, the better your overall health can be. Your teeth take the brunt of the impact of your eating and drinking choices. Eating something hard and crunchy or sticky and chewy can cause immediate damage to your teeth. A broken or chipped tooth can happen in an instant. The damage from harmful acid eroding your teeth and gums can take a long time. Foods that contain sugar, starch, or fermentable carbohydrates interact with the bacteria in your mouth to create harmful acid. When you consume these types of food or drink, be sure to drink plenty of water to help rinse away the harmful acid. Drinking plenty of water is good for your overall health, but it is specifically healthy for you mouth. Eating a mineral-rich diet can help aid in the remineralization of your teeth. Foods with calcium and phosphate are helpful in this. Brushing your teeth twice a day will help keep the surface of your teeth clean. 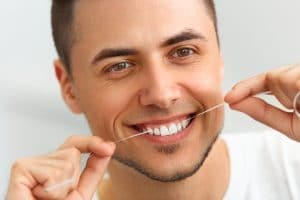 Flossing twice a day will help keep your gums and the surfaces between teeth healthy. Visiting your dentist at least twice a year is also important for your oral health. Your dentist may be able to detect an issue before it progresses into something more serious. If you have a feeling that something is wrong in your mouth, it is better to get to the dentist sooner than later. Dr. Huffstutler can give you more ways to protect your teeth. To schedule a consultation, call our office in Ft. Worth, TX, today at (817) 577-1444. Our office welcomes patients from all over DFW, including Dallas, North Richland Hills, Denton, the Mid-cities, Southlake, and all surrounding communities.